For several centuries, Odawa people have been on these shores and in the woods and hills of this land. We are living amid the places from which spring the stories of our world, ourselves, our families and our tribal nation. The original tribal trails throughout Michigan are a walk through history. Sometime in the 1200s, the Anishnaabe people started using this trail, which soon formed into the Three Fires, consisting of the Ojibwe, Odawa and Potawatomi Tribes. 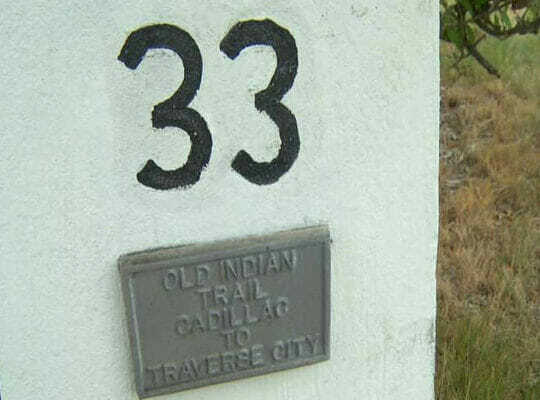 Some records show the possibility of the Cadillac-Traverse City Old Indian Trail beginning as early as 700 BC. The Hopewell civilization (also called Adena in some regions) is a prehistoric culture of the American middle-west. Experts have found evidence of this prehistoric culture dating back to 600 BC. Large shaped burial mounds and extensive trade networks are characteristics of this ancient civilization. Areas around Cadillac illustrate evidence of these burial mounds. Many exist at or around the Cadillac Country Club. DOWNLOAD: Get your own printable Old Indian Trail Map! Download Now! We know that Indians belonging to The People of the Three Fires used the area between Upper Clam Lake (Lake Mitchell) and Lower Clam Lake (Lake Cadillac) establishing campsites for hundreds of years. Aging relics found in the burial mounds shows that establishment of the trails in the area may go back well before either recorded or oral histories. Might there possibly have been a Hopewell village established here in the mystic past? Throughout the past, stories like this have captivated the minds of many history buffs and the first modern mappings of this trail system started to get pieced together by Milo Petoskey Crosby. Upon his arrival to Wexford County in the late 1800s he was captivated by the trail, so much, that upon his retirement (in the early-mid 1900s) he began to mark the trail. He spent years walking the trails based on fragmented historical documents, finding the remnants of the Old Indian Trail. During the 1940s he placed 14 stone markers, which started on Lake Mitchell and ended at the Manistee River near Sherman. After the original 14 markers were placed, the trail was visited by a select few historians and people with ancestral ties to the trail. This went on for years until James Comp and Ed Babcock, historian and retired Cadillac High School teacher continued the work that Crosby started. Comp and Babcock worked to map and place the next 5 markers. Finally, in 1987, after 7 years of planning, research and fundraising, trail markers 20-33 were placed by former Little Traverse Bay Bands of Odawa Indians chairman Frank Ettawagheshik. Ettawagheshik along with the Grand Traverse Sesquicentennial group completed the trail to the West End Beach on the Grand Traverse Bay. Trail Marker #1 is found on the Northeast shore of Big Clam Lake, later called Lake Mitchell. Nearby is Little Clam Lake, East and downstream of Big Clam, now called Lake Cadillac. The Hopewell left many indications of their occupation of the area. When their group disappeared, only seasonal use of the area occurred. Anishinaabe visited to harvest the rich natural food and forest resources but did not stay year around. The Inhabitants of this region remained sparse deep into the mid 1800s. A change accelerated after America’s Civil War ended. Railroads were extended and opened up the wilderness. Settlers came in mass numbers to the region. located here. They grew several species of corn, beans and squash at least 1200 years ago, long before the Europeans arrived. Large white ash trees used to adorn the location of this marker. according to old texts on this region. Ash were one of the most useful woods used for making native tools. No ash are left at this location, largely due to the Emerald Ash Borer, which has destroyed many of the ash in the region. Just West of Marker #9 is the Village of Meauwataka. Meauwataka means “half-way” in Pottawatomi. As this area is about halfway between Lake Mitchell to the south and the old Indian village on the north bank of the Manistee River lying ahead along the trail, credence is lent to the story that early travelers stopped and camped on the shore of Meauwataka Lake, located West of the unincorporated village. The Old Indian Trail crosses another old road at Marker #12. The cross-state stagecoach road passed thru on what is now M-42, a state highway section passing between Sherman and Manton to the East. Sherman was one of the earliest villages to be built in Wexford County. It was the first County Seat. This road like the Cross-State Stagecoach Road runs basically between Sherman and Manton. These two roads are the only two such through roads in the area. You can see by satellite view that the sections between these two roads are the only basically contiguously cleared land between these two villages. Perhaps, the freight wagons moved carrying heavier loads at a slower pace and tore up the roadway with deeper ruts, thus the freight designation. The stagecoach could perhaps move at a more rapid pace on a dedicated purpose road. The Michigan State Forest Campground System maintained a series of campgrounds on the Manistee River. Previously located approximately a days canoe travel apart, many are now closed including this location at the long existing buildup of logs called the “Pony Jam”. Indians, their families and their animals were able to safely cross the river on the densely packed top surface. Early white settlers remember using this bridge as well. Downstream a short distance was a similar log jam on which a buildup of soil had occurred. On that soil surface a large tree perhaps hundreds of years old was growing. Lumber companies wishing to move their newly cut timber by river down to their sawmills removed these years-old natural bridges. Reportedly, 700 pounds of dynamite was required to accomplish this task. The Boy Scouts replaced Marker #14 shown on the left side in the picture above and waded the river to re-furbish the Marker #15 on the opposite side of the river. They accomplished this on a September day with normal water flow. Early historians discovered and counted over 150 ire rings. While likely not all occupied at once, indications point to extensive use as a campsite for a long number of years. A short path extends from the right of the marker down to the Old Indian Trail which comes up the 80 foot bluff passing from left to right and then onward in a Northwesterly direction. West Branch Anderson Creek gathers water from marshes in this area before joining the North Branch Anderson Creek and draining into the Manistee River. Some stands of Black Ash were located here in historic times. Black ash is highly prized by Indian craftsmen for the “splints” that could be gotten by pounding the outside surface of a growth ring causing it to separate from the next layer. Split then in half, these splints would be woven into many varied and intricate types of containers. St Mary Church was established in 1884. Roads in the area still consisted mainly of simple trails between village centers. The North-South Old Indian Trail was still likely the best access to Traverse City, perhaps a good reason for locating the church on this corner. The East-West trail at this location connected Eastward to Kingsley, located on the railroad. A school established in 1907 still operates today. US31, the current road designation as it passes this marker turns North and joins M37 to loosely parallel the Old Indian Trail for a stretch at what is now called Chums Corners, the longtime site of a general store-like business which operated for years after the State Road was put in place. Once, well out in the country outside of Traverse City in Southwest Garfield Township, the Old Indian Trail pathway and the State Road simultaneously crossed a township road which came to be known by the school located on the Northeast corner of the intersection. The farm family owners donated the property upon which the school was built and in the custom of the day was named Rennie School after the property owners. William, and later son, William A. Rennie built and ran a prosperous farming operation. The Boardman River lies ahead so we turn left to parallel the stream because the Cass Road bridge hasn’t yet been built. Shortly, we pass the later site of a dam forming Boardman Lake and where the Hannah and Lay Flour Mill was soon located. Lay Park followed by Hannah Park were established on the South bank. A Traverse City postcard from an era shortly after the Carnegie Library was built in 1903 shows this Boardman River vista with Lay Park at the library and Hannah Park toward us on the right. The town was growing up and out. Left you can see the Hannah and Lay gristmill and dam. If you were walking the trail in later years, you passed the Hannah home and the Carnegie Library on Sixth St., soon to reach where the river looped 3/4 miles ENE to join the bay. The trail’s track to the finish from the river loop first crosses Kids Creek at that loop and meanders NW to join the bay near what is today the US31, M37 & M22 intersection at West Bay Beach. Our travels of (55) miles in distance representing (2600) years of trail users on the CADILLAC TRAVERSE CITY OLD INDIAN TRAIL have come to an end. I really want a map of the trail but all the links fail to find anything. Thank you for your interest, we have updated the links and you should be able to access the downloadable maps now. Thank you for your interest in the Old Indian Trail in the Cadillac Area! Have a great day!